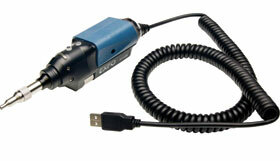 Exfo announced what it believes is the world’s first fully automated fibre inspection probe for field testing. By integrating automatic focus adjustment capabilities into the FIP-430B inspection solution, Exfo has made the test sequence completely automated, making fibre connector inspection a one-step, error free process. The probe integrates advanced automated features such as a high-performance, fibre image-centring system and onboard connector-endface pass/fail analysis based on IEC or custom standards to deliver accurate and consistent connector certification in seconds. Not only is the image always captured with optimised quality, the focus protection feature prevents image capture in the event of improper focus adjustment, thus ensuring that no defects or residues affecting performance can be ignored when doing analysis. The FIP-430B USB inspection probe is compatible with any PC or laptop, as well as with Exfo’s entire fleet of FTB Ecosystem platforms.